Another high quality match in a rejuvenated Premier League. Mauricio Pochettino’s Spurs offered a masterclass in high pressing, as they prevented Pep Guardiola’s side from playing the ball out from the back, won most second balls and 50-50 challenges, and suppressed David Silva all game. Spurs started in a rough 4-1-4-1, although this was closer to a 4-4-2 diamond in possession, and varied as they pressed high. They possessed no true shape during the first hour, when the game was decided. Pep Guardiola, hampered by an injury to Kevin De Bruyne and Nolito’s suspension set his team up in a 4-2-3-1. Fernando played alongside Fernandinho in midfield, while Jesus Navas started wide on the right. The most interesting aspect of this game was the sheer number of long balls Manchester City were forced into attempting. Guardiola insists that his sides play the ball out from the back; he believes that by slowly advancing up the field, his team will be able to easily regain possession simply through positioning after losing the ball in the opposition’s half. The signing of Claudio Bravo, at the expense of Joe Hart, demonstrated the importance of ball-players in the Catalan’s system, as Guardiola elected to keep underperformers like Alexander Kolarov mainly due to their passing ability, and shift those without that ability out of the team. Mauricio Pochettino, however looked to cut off City’s attack at its very source, and Guardiola’s team struggled to play the ball out from the back. Spurs played man to man marking all over the field, and City struggled to maintain any control, with Claudio Bravo often forced into playing the ball long, as he had no options to pass to in front of him. Guardiola’s approach at City has been refreshing for his willingness to employ the long ball and counter-attacking tactics, but make no mistake: Spurs forced City into uncomfortable long passes. Their intensity was remarkable, but expected, as few sides, if any in the Premier League, will invite them to press by passing in their defensive third. Bravo rarely had any passing options during goal kicks, and his defenders had to work hard merely to open up passing lanes. At times the Spurs even went beyond mere man-marking, and double teamed players high up the field. 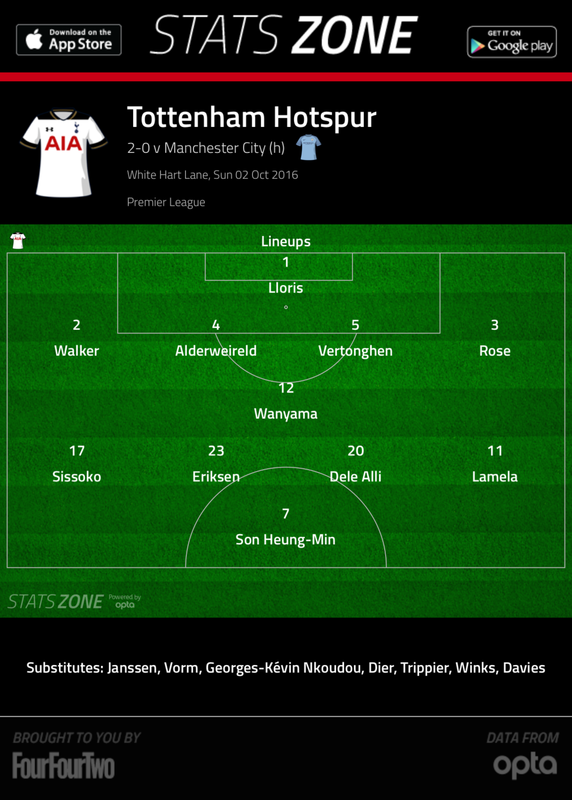 Son, Sissoko, Alli and Lamela pressed the back 4, wile Christian Eriksen would frequently get involved. Even if a City player managed to get time on the ball, 2 of the aforementioned duo would end up bullying him out of it, while the rest closed down passing lanes. 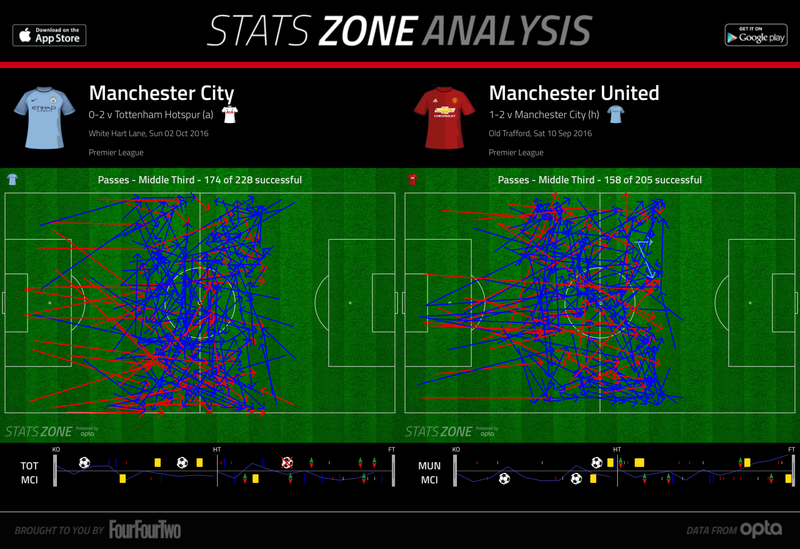 Indeed, City’s passes out of defense were arguably worse than United in the Manchester Derby, who also struggled to play the ball into midfield. Guardiola’s side failed to execute their basic game plan, and were often second best in 50-50 challenges as well, as the Spurs were simply too intense and daring, and played with vigor that Manchester City hadn’t faced prior to their game against Celtic. Pep’s Barcelona, and even Bayern, have come up against sides willing to press for a prolonged period before, but often had the players to prevent sustained dominance. Xavi, Busquets and Iniesta at Barcelona, and Xabi Alonso and Phillip Lahm at Bayern Munich come to mind. In England, Guardiola has come to rely on Fernandinho to play as a pivot; the Brazilian has been tasked with dropping into defense in possession, and linking attack with defense. In this match, however, Guardiola picked Fernando in the pivot role, and Fernandinho as a second pivot of sorts, who would assist Fernando, but not act as the primary receiver of the ball. Fernando’s inability to play the ball into midfield harmed City, as he was easily closed down by the Spurs attackers, and Fernandinho often dropped deeper to receive passes as a result. Ultimately, they were frequently forced to pass long to the wings. Even when City managed to get the ball into midfield, they struggled to maintain it because they only had 1 player who could truly threaten in central areas: David Silva. Sergio Aguero was often isolated up front, while Jesus Navas was peripheral all game. Raheem Sterling has been very influential this season, but he has often made runs in behind and into the box, rather than carrying the ball forward. 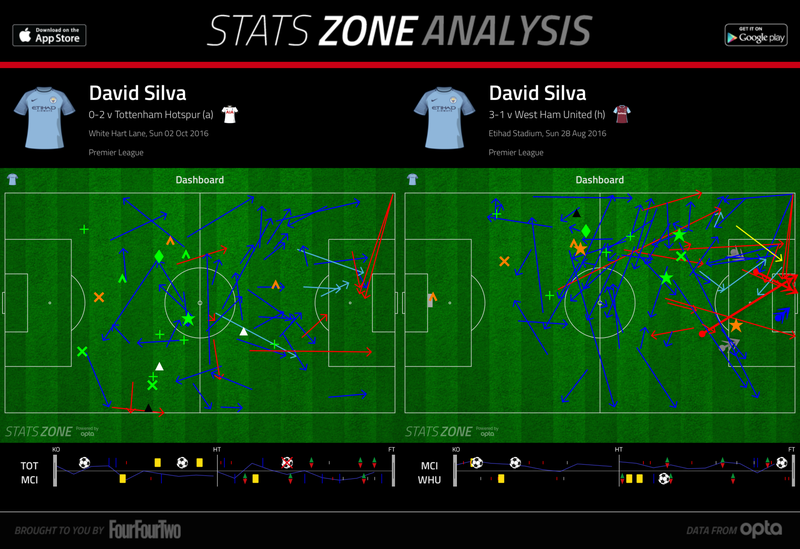 Pochettino’s men coped admirably with David Silva, who was often double teamed, and had little influence on the game. If either Nolito or Kevin De Bruyne had been present, City’s attack would have been more potent by virtue of being able to drive forward from midfield. Its hard to understand why Guardiola didn’t play Ilkay Gundogan from the start. Gundogan’s ability on the ball, and his ability to play as a pivot made him suitable for this game. Then again, perhaps Guardiola was expecting more of a midfield battle, rather than a match which often saw City trapped within their final third. Compared to the number of times they regained the ball high up the field, or won the second ball, Spurs created few chances. Their attack was inefficient, if relentless in its attempts to expose City. Son, for example, was excellent in his movement, often exposing John Stones, while Dele Alli made continuously beat Alexander Kolarov. 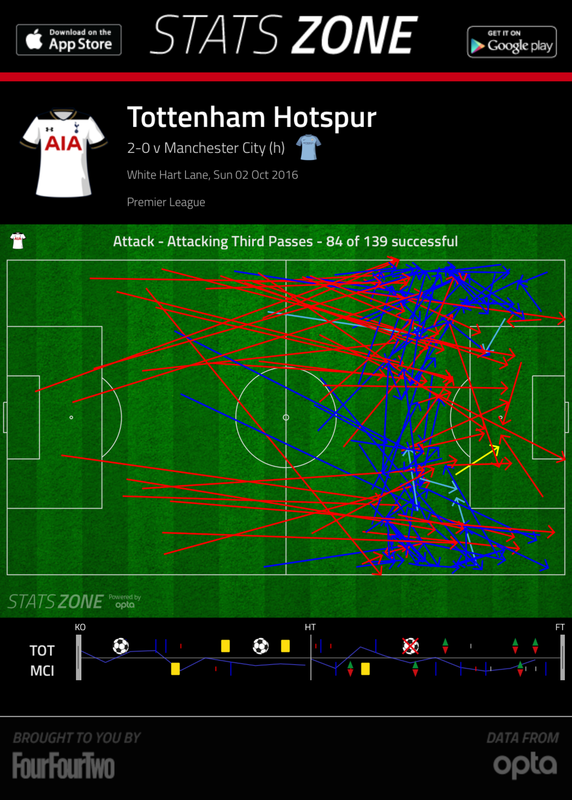 But Spurs ultimately won on the back of an own goal and 1 excellent attacking move. Against a City defense that nearly unraveled in 5 minutes against Manchester United in the derby, and one that was beaten 3 times at Celtic Park, the Spurs could have been better. The inefficiency in attack was likely due to the energy Spurs were expending to regain the ball in the first place, and its unlikely that they will have to press with this much energy again this season. After all, every time they regained the ball, they simply knocked it long to attackers who had, just a few seconds before, pressed with intensity to regain it. Mauricio Pochettino set up a side to aggressively mark City all over the pitch, and the Argentine’s young, energetic team responded with committed performances that thwarted the Blues’ predictable gameplan. Spurs’ pressing was unsustainable, however, and it will be interesting to see if they can maintain consistent performances as the season progresses. Pep Guardiola’s City is clearly still in its infancy; a better drilled version of this team will be able to bypass this press within 20 minutes, rather than an hour of play. Indeed, the only time City seemed to come into their own and control the ball was when Spurs’ energy levels predictably dipped. The benching of Ilkay Gundogan is hard to understand, the former Dortmund man would have provided far better support to Fernandinho than Fernando did, but Jesus Navas starting in place of Leroy Sane suggests that the German is not ready to start. The reverse fixture shouldn’t prove to be such a one sided affair. Its clear that Premier League is a notch above previous seasons, with a variety of tactical styles on display that emphasize pressing over anything else. The next interesting contest of this caliber should be Liverpool v Manchester City. Liverpool subdued Tottenham at White Hart Lane, and Jurgen Klopp’s relatively strong record against Pep Guardiola suggests that he too can devastate the Mancunians.